Pork dumplings with spicy sauce at Palace Dumpling in Wappingers Falls. Each adventurous restaurant-goer has her own version of the Authenticity Test. Some of us like to scroll through reviews on social media sites before dining out, others hunt online for proof of the chef's pedigree. Put to these types of tests, Palace Dumpling certainly looks attractive. 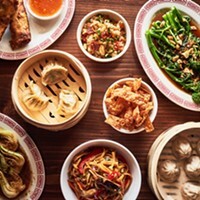 Three and a half years out of the gate, this humble dumpling house in Wappingers Falls has four and a half stars on Yelp, a veteran dumpling chef hailing from northern China's Dongbei region, and loyal patrons who know a thing or two about Chinese delicacies. 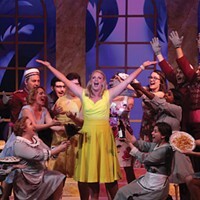 Nevertheless, hopeful diners might have second thoughts about the restaurant's location (in a strip mall, next to a pizzeria and a bowling alley) or its sparsely decorated dining room. A freshly pressed dumpling before it’s sent to the steamer. In the end, good food is about only one thing: good cooking. And when it comes to dumplings, cooking is something Palace Dumpling chef Jenny (Yanmei) Hu does exceptionally well. Hu, a sturdy middle-aged woman with a radiant smile, has been making dumplings since she was five. 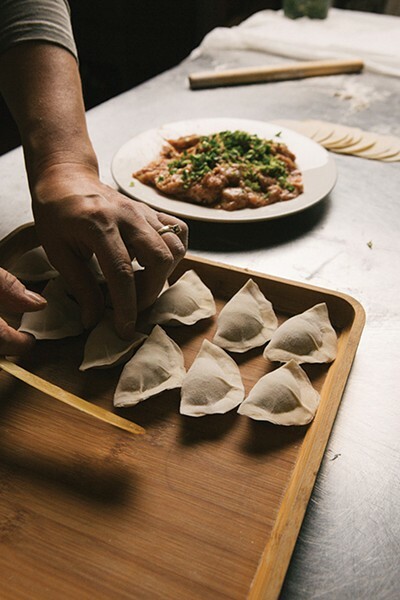 Growing up in northern China's Heilongjiang Province, she began by helping roll out the dough in her mother's kitchen and graduated to kneading as she got older. By the time Hu met her husband, Joe Conetta, a recently retired environmental pathologist, she had been running her own fish dumpling establishment for over seven years. After marrying Conetta, Hu emigrated to the States, and it wasn't long before they decided to open a dumpling house in the Hudson Valley. Conetta, an endearing man with a penchant for storytelling, runs the front of the house; Hu manages the kitchen. Together, they devote the restaurant to time-honored traditions and recipes that have been in the Hu family for nearly a century. It's a Tuesday afternoon in early autumn, and the Palace Dumpling kitchen is preparing for dinner service. One prep chef puts on a pot of rice before returning to the dough table, where little nibs of freshly kneaded dumpling casing stay moist under a protective cloth. I watch as she flattens one of the sections with the palm of her hand and then switches to a miniature rolling pin, passing it over the dough until it has become perfectly round and wafer thin. Each and every piece gets this individualized treatment before it is stuffed, sealed, and either steamed or sautéed. You would think, what with the restaurant's routinely busy weekends, the kitchen would have quit making each dumpling to order, but this is evidently the only way to ensure consistently high quality. If Hu were to roll the dough out into one big sheet and use a ring form to punch out the casings cookie-cutter-style, some would be too thick and result in a doughy or undercooked dumpling, while others would be too thin and cause the dumpling to fall apart. On the opposite counter, another prep chef is busy flattening small chunks of shrimp with the broad side of a butcher's knife. This, too, appears to be a painstakingly slow process. When I ask Conetta why the prep chef doesn't just put the shrimp in a food processor, he shakes his head in protest. "No, no. By hand is better; you get a better texture. A food processor would make it too bland, too much like putty." Meanwhile, Hu herself prepares fried rice for a customer, adding shrimp and thin slices of Chinese pork sausage to the wok. Unlike the fried rice so often found at take-out joints, this rice is still white when it leaves the service window. No food coloring, and no other shenanigans either. Between Hu's culinary standards and Conetta's past as an environmental pathologist, the kitchen works with only fresh ingredients sourced from traditional and Asian markets in the region. Hu says it's expensive, but she wouldn't have it any other way. Palace Dumpling offers over 30 varieties of dumplings alongside a host of soups, salads, noodle dishes, and tea. For between $8 and $13, you get a plate of 12 dumplings, enough to fill you up on your lunch break or accompany with a salad for dinner. 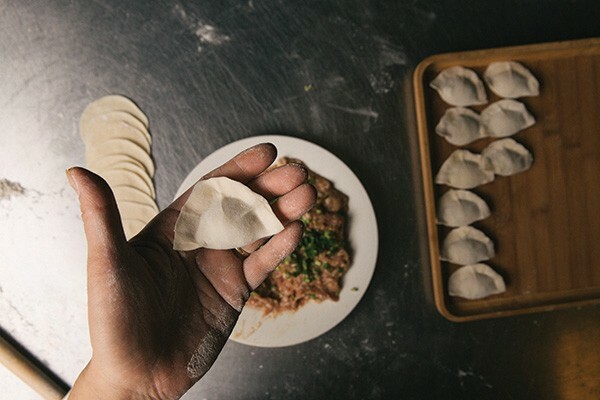 In contrast to the doughier baozi dumplings of Cantonese dim sum fame, Palace's Manchurian jiaozi consist of thin, nearly translucent wheat casings filled with moist, explosively flavorful vegetable and meat medleys. Done right, the filling will release a savory broth during the cooking process and lend the dumpling an extra burst of flavor. Conetta advises diners to resist the urge to cut into a dumpling— what he calls "doing a biopsy." "If you cut into it, the broth goes all over, so the way to do it is to eat the dumpling whole." Among the most popular dumplings is the shrimp with pork, which is similar in flavor to the Cantonese shrimp shumai. Unlike shumai, however, these dumplings have bite; you'll encounter whole chunks of shrimp in every mouthful. The menu also features dumplings pairing lamb with vegetables like squash, mushrooms, or watercress. While lamb is uncommon in southern Chinese cuisine, it appears frequently in recipes from the north. Also of note are Hu's salmon with chive dumplings. Remember, fish is her specialty, and these dumplings are a testament to her skill. Vegetarians will relish the eight-ingredient vegetable dumplings, which dance on the palate with earthy notes and swells of ginger. Recently added to the menu, the egg, mushroom, and sweet pepper dumplings are worth having pan-fried for an extra dollar, as the sear pairs well with the dish's pronounced shitake flavor. The dumplings are delicious on their own but may also be paired with one or more of the complementary homemade sauces. 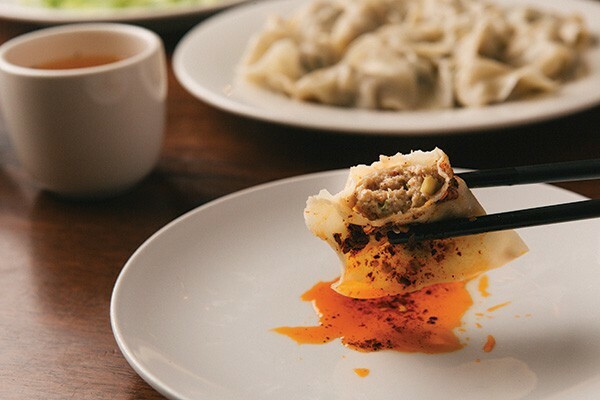 The simply named Dumpling Sauce, sharp and mustardy, goes especially well with the pork dumplings. The Sweet Dumpling Sauce, a medley of soy, ginger, garlic, and family secrets, nicely accents the fish and shrimp plates. Even the Hot Pepper Sauce goes above and beyond the call of duty with its toasted sesame seeds and mellow heat. Even though Palace's kitchen was short-staffed the day I visited and has apparently made it common practice to do all the necessary work by hand, our dumplings arrived at the table in under 10 minutes. Vivian, our server, answered questions about the menu in a friendly manner and drew our attention to the restaurant's salads, which get almost as many rave reviews as the dumplings. (Spicy food fanatics: the Tiger Vegetable Salad may be your undoing. It's Hu's Western twist on a traditional Dongbei dish, a mélange of jalapeño, onions, scallions, and cilantro tossed in a wasabi dressing.) People come from as far north as Greene County and as far east as Connecticut to enjoy Hu's cooking and the relaxed dining environment. The restaurant is also popular among students at the Culinary Institute of America, who have to drive past a veritable procession of other Asian restaurants to get to Palace on Route 9. Even without a kid's menu, the restaurant manages to attract families with young children. In other words, Palace is the Chinese equivalent of that little hole-in-the-wall Italian bistro nobody knows about but which makes the best carbonara this side of the Atlantic. Except at Palace, there's enough seating to accommodate a party of 18. So perhaps some of our Authenticity Tests could use an overhaul. It's bad when our instincts lead us to a disappointing meal at an otherwise class-act restaurant, but it's even worse when they keep us from culinary diamonds-in-the-rough. 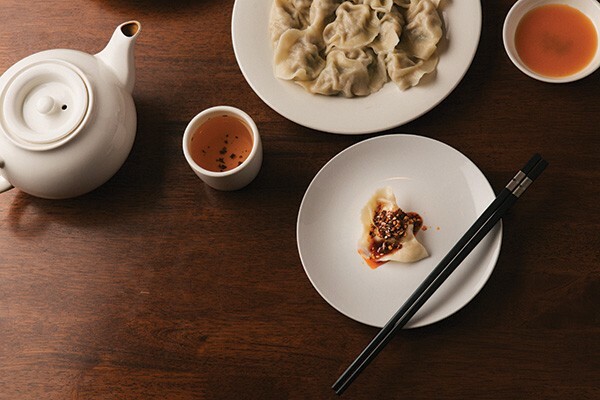 Should you choose to visit Palace Dumpling, you will likely listen to an accordion play Pachelbel's Canon while you consult the menu, and you will likely hold conversation under its token Chinese lanterns while you wait. But you will not wait long, and you will not be disappointed. Open for lunch and dinner seven days a week: Sunday-Wednesday, 11am to 9pm; Thursday to Saturday, 11am to 10pm. No reservations, no delivery, no alcohol.